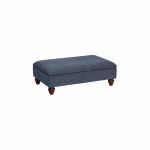 The Ashdown storage footstool in Hampton Navy is the ultimate accessory to accompany your Ashdown sofa or chair, allowing you to put your feet up in style! 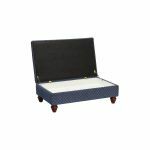 Upholstered in irresistibly soft fabric, its deep storage compartment features an easy-to-open mechanism for convenience and is the perfect hiding place for remote controls, magazines, and other essentials. Built from high-quality materials, the Ashdown storage footstool is designed to keep your living room clutter-free for many years to come. Discover the rest of the Ashdown range today, and find more beautiful pieces to complete your home.